New York, we have a delicious announcement to share with you. Time Out Group is launching a new hotspot for food and culture lovers right here in Gotham. Time Out Market will bring the best of New York City's restaurants, bars and cultural experiences—all handpicked by expert Time Out editors—together under one roof in Brooklyn's Dumbo neighborhood. 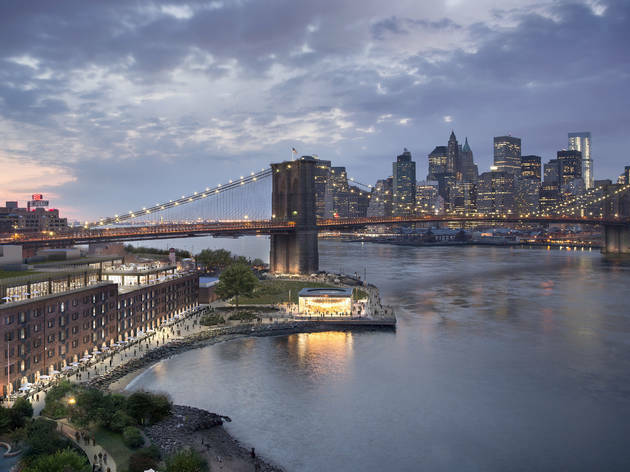 The market is set to open later this year at 55 Water Street within Empire Stores, complete with two floors, three bars, an outdoor rooftop area and a fantastic view of the Brooklyn Bridge and Manhattan's iconic skyline. Check out the concept our editors are currently curating for you. It's true: You'll eat meals from award-winning chefs, sip on refreshing cocktails, and take in breathtaking waterfront views and artistic performances all in one place. Feeling hungry and not sure what you want? No worries: The market will have 20 eats to choose from, plus three bars, a stage for performances and exhibition space. Want room to breathe in the busy city? Our space will occupy 21,000 square feet over two floors, with around 520 seats indoors and outdoors. Just want to gaze out over this great city? 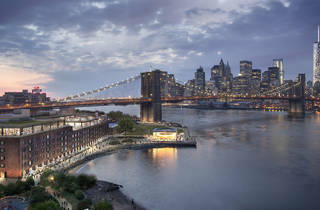 The rooftop on the fifth floor will offer great views of the East River, the Brooklyn Bridge, the Manhattan Bridge and the skyline of Lower Manhattan. The Market will be one of several that Time Out will launch globally. The hugely popular Time Out Market Lisbon opened in 2014, Time Out Market Miami, Boston, Montreal and Chicago markets will open in 2019. And get excited for Markets in London, Prague and Dubai in subsequent years! We hope you're just as excited as we are to bring this center of cuisine and culture to the city. In the meantime, follow along here for all the updates you'll need. See you at Time Out Market later this year!